So The Legal Genealogist is off again this weekend (can you tell it’s conference season?) and this time to a state through which just about all of my mother’s ancestors passed at one point or another — Virginia. And in honor of those ancestors and this weekend’s celebration of Virginia research, here’s a little tip on researching early Virginia records: thanks to a man named William Waller Hening, it’s really easy to find out what those records mean by looking at the laws of the Old Dominion that impacted them. And his most enduring legal legacy was a monumental 13-volume work containing the laws enacted by Virginia’s legislative bodies (the House of Burgesses and the General Assembly) between 1619 and 1792. You can also find the entire set of 13 volumes digitized online at Hathitrust (“a partnership of academic & research institutions, offering a collection of millions of titles digitized from libraries around the world”), from the University of Michigan Library here, and from the Harvard University Library here. And a search for “Hening Statutes” at the Internet Archive will turn up these digital images as well. 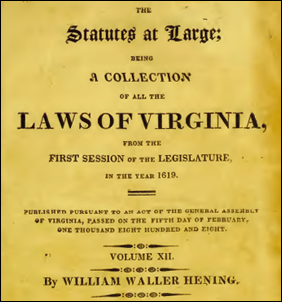 A reprint series is available in most major libraries: William Waller Hening, ed., The Statutes at Large; Being a Collection of All the Laws of Virginia, from the first session of the Legislature in the year 1619, 13 vols., reprint (Charlottesville : University of Virginia Press, 1969). And there’s one more source for these early laws: a transcription of Hening’s statutes keyed in by Freddie L. Spradlin, Virginia state coordinator for the USGenWeb Project. This database, titled Hening’s Statutes at Large, is fully-word-searchable, though the results pages can be a bit hard to navigate. Judy, I don’t know if these are on line or not, but there’s still more that has been published: (1) Waverly K. Winfree’s Supplement to Hening of laws not in Henings or only referenced by title, 1700-1750, from records found in London (Virginia State Library, 1971); (2) Samuel Shepherd’s Laws of Virginia 1792-1807 in three volumes (1835. Reprint. AMS Press, NY, 197070) and (3) Joseph J. Casey’s Index to personal names in Hening and Shepherd (1896. Reprint. Genealogical Publishing Company, Baltimore, 1967). Some are, Craig, but not all. Good references, though! Thanks! Judy, how much do “Henings Statutes” cover the early years of Kentucky? Up until June 1, 1792, Stan — that’s when Kentucky became a state on its own. Judy, a great reminder to look for details even if in doubt that they exist. What is no sought is seldom found.